On Saturday, we boxed up a rather large custom order that Lisa delivered later that morning. For approximately 2 hours, I was finally able to see the top of my DIY Dog Mom Project Workshop table. I wiped it down and organized my paints and brushes and supplies. Then, Lisa started stocking the table with pieces from the woodshop. The saws and sanders got quite the workout over the weekend. I'm really excited about the pieces Lisa whipped up in her woodshop. In addition to a couple of birdhouses, she made quite a few slat signs that I'm going to use to make decorative garden stake signs. 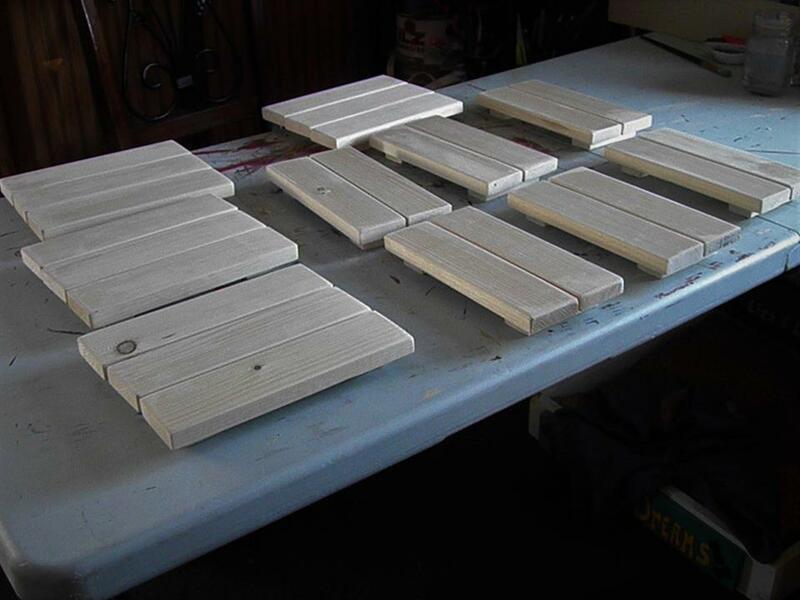 The larger slat style signs will be used for Dog Mom décor that I'm making for Mother's Day. I spent most of yesterday painting the pieces and gathering inspiration for the detailing. Lisa made the wooden stakes for the garden signs. I'll get those painted today. While I was painting the slat style signs, I thought back to when we had to purchase them. Already made. Unfinished. That was before we cleared the basement to make room for Lisa's woodshop. That was almost 2 years ago. I hated buying unfinished slat style signs. They were expensive. But at the time, Lisa didn't have the woodshop. Now, instead of walking into a craft store to buy unfinished slat style signs, we go to Home Depot to buy the wood for Lisa to build in her woodshop. That's a really great feeling. My goal is to finish up this batch of Up For Grabs items by the end of the week because it's almost time to start making Mother's Day pieces for all the Dog Moms out there!